One of the countryside's best-loved and noisiest birds is being tempted to Cornwall. The Royal Society for the Protection of Birds (RSPB) has created a breeding sanctuary for the booming bittern at Marazion Marsh, near Penzance. 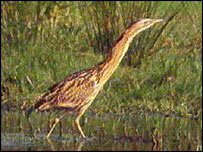 Once common in Britain, bitterns almost died out as their reed bed habitats were drained for farming. But now the reeds are being restored, the bitterns are returning - and they are being encouraged to Cornwall. Marazion Marsh can be used to attract the birds because it has reeds which can be used for nesting and features deep water for their favoured food of fish to thrive. Figures from joint research by the RSPB and English Nature earlier this year showed the species appeared to be recovering well from its near extinction in 1997. The RSPB said intensive work to create new reed beds, and better management of their existing homes, helped reverse the previously dramatic decline in the population. The 28 to 31 inch (70 to 80 centimetre) long-birds, are heron-like, with a long pointed bill and distinctive golden-brown mottled plumage. The males are famous for a "booming" noise that they make, which can sometimes be heard up to 3.1 miles (5 kilometres) away. Dave Flumm from the RSPB in the South West said: "As a birdwatcher myself, we're really keen to see them. "They're such a rare bird, it's really quite an adrenaline rush when you see one in the winter-time here."